It’s hard to believe 2019 is already here. The beginning of a new year provides the perfect time to look forward and see what the hospitality industry will look like as we inch closer to the next decade. Here are six trends in hospitality technology that your company should keep an eye on in 2019 and beyond. It’s necessary to provide connectivity; it’s beneficial to provide a network that gives guests a similar experience to what they expect at home or in the office. To this end, hotel managers will continue evaluating data bandwidth to ensure they can meet the demands of their guests—especially as more people depend on multiple devices during their stay. What good is a network if it can’t keep pace with your guests—and your staff—because too many people are on it at the same time? In an age where guests are streaming an endless amount of OTT content, hoteliers need hospitality technology that works at lightning-fast speed. In addition, guests traveling for business may need to hop on video calls or download large files throughout the day. Agile, secure internet services are a necessity for both business and leisure guests. Hotels should be equipped with fast networks to ensure that operations keep running smoothly. Add it all up, and speed is a top priority for all competitive hotels. When it comes to hospitality technology, today’s guests expect an experience that feels like home. Hotel managers looking to differentiate their properties should consider investing in hotel TV systems that support casting. People have grown comfortable casting content from their mobile devices onto appropriate platforms, including their televisions. Although they might not yet expect to be able to cast onto a hotel room TV, they will be delighted to find out that they can. Many of today’s leading hotel properties have already integrated smart technology into their networks. Not only does this technology make a guest’s stay more enjoyable and personalized, it increases staff efficiency and creates additional revenue opportunities. For example, a guest might not consider ordering room service until they see it’s available via their interactive television, or the simplicity in booking a spa appointment makes it a must during their stay. 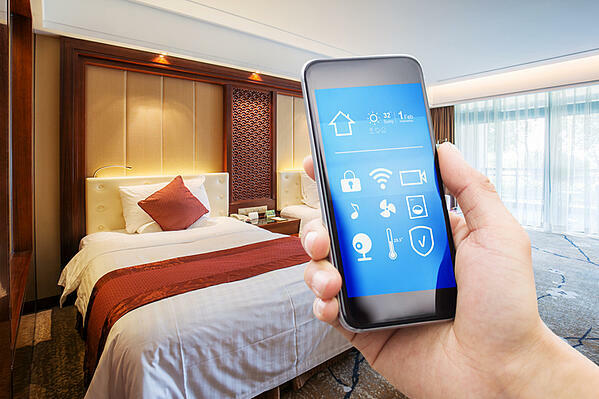 Smart technology is quickly infiltrating hotels with new amenities such as voice recognition solutions that enable guests to open blinds, control the thermostat and lighting and room keys operated by property app on the guest’s phone. The technology is becoming more advanced and offering guests additional control and comfort in their room increasing overall satisfaction. Hospitality managers are experts in making sure guests have a memorable time during their stay. It is important for friendly staff members to help guests locate anything they need and suggest local activities to enjoy. As hotel technologies become more complex, hotel managers are increasingly looking to their technology vendors as trusted partners to guide them. These providers are equipped with the expertise needed to address the hotel’s needs and problems, and can offer recommended courses of action. By partnering with the right technology providers, general managers get the peace of mind that comes with knowing their technology services are in great shape—and if they are not, help is always a phone call away. As a result, managers have more time to focus on meeting the needs of their guests. By the end of 2018, more than 33 million Americans had cut the cord—ditching traditional cable television in favor of OTT services and streaming content. This trend will accelerate in 2019 by moving out of residences into hotels and managed properties, such as assisted living and senior living communities. People and businesses are cutting the cord in order to to reduce their monthly expenses. Thanks to modern hospitality TV systems, properties can lower their costs without having to compromise on the quality of the programming they offer. Whether you’re ahead of most of these trends or trying to catch up, migrating to a modern hospitality TV system installed by an experienced provider can help you take the guest experience to the next level.